Decorating is my favorite thing for the holidays. I have so many decorations I can hardly wait to put them all up. 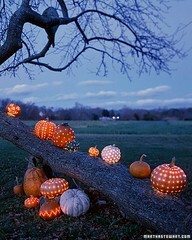 Pumpkins are the signature for fall and Halloween so what better idea to find fun decorating ideas to go with them. You need to turn the pumpkin on its side and use a knife to cut the bottom of the pumpkin. Make sure the pumpkin is large enough for you to stick your hand in to clean out all of the yucky insides. 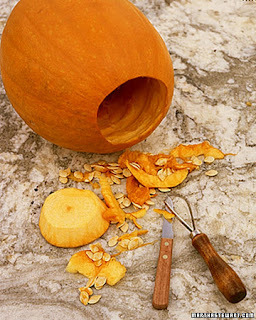 Remove everything inside the pumpkin. Then turn the pumpkin right side up. You need to then drill holes using a 1/4 inch bit. You can make randomly spaced holes or you can use the black tape for a guide as a uniform pattern. Insert a string of lights through the bottom, and place one bulb in each hole on the pumpkin. Push the bulb through so that the bulb is sticking out of the hole just a little. Tuck all of the remaining lights into the pumpkin and turn the pumpkin right side up, with the light string running out from the bottom of the pumpkin. Then just plug them in and you are done. I LOVE it!! Oh how I love Martha Stewart! And I have this pic pinned on my pinterest page too. :) Great taste! Thanks... I am following your blog and you have some very cute ideas. I will have to link up to your follow me fridays. Thanks for letting me know.